These science students are in a special school in Bucaramanga, Colombia, South America, which was built in 1987 to provide basic education for the thousands of refugee families who had fled the violence of their home areas. Construction of the school was financed by the Rotary Club of Bucaramanga, the local Chamber of Commerce and a local developer, with equipment and supplies provided as foreign aid by the Government of Canada. A second school was built in a neighbouring community in 2011 by the Rotary Club of Bucaramanga Millenium to accommodate the overflow of refugee students. Now both schools are being enlarged to provide for still more elementary and high school students. 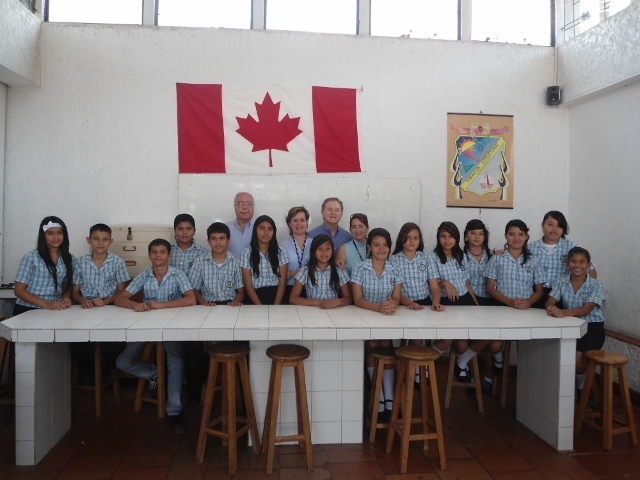 Vancouver Sunrise is partnering with the two Bucaramanga clubs to provide furniture, equipment, books and teaching supplies for the new classrooms in the expanded schools. Each club has a goal of raising $7,000 CAD for this purpose. Sheila Anderson and Ann-Shirley Goodell are working with the Bucaramanga clubs to prepare grant applications for matching funds from the Rotary districts and The Rotary Foundation, with a hoped-for total budget of $40,500 CAD. ...and more. Four staff and board members of the foundation that operates the two schools in Bucaramanga will be here for the Fiesta. They will be visiting several Vancouver non-profits and foundations to learn strategies and operating methods they can use in Colombia. Of course, they will also lend an air of authenticity and fun to our Colombian festivities. The club is currently forming a committee to plan this Fiesta event for next March.